Glazing. Aircraft/aerospace maintenance and repair. Oil and gas. Steel erection. HVAC. Plants/warehouse. Building/construction. Marine/vessels. Military. Utilities. Energy. Waste management. Municiples. Mining. Manufacturing. Auto. Packaging. Healthcare. Overview: 2,000 lb. (905 kg.) Cap. 20 ft. 3 in. (6.1m) hook height. Battery powered w/ charger. 30 FPM (9m/min.) line speed. 100 ft.(30m) cable. Fits in doors/elevators. Pick and carry loads. Safety factor: (1.5). Max rooftop depth: 7 stories. Two year warranty. 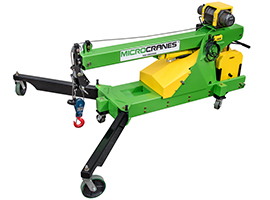 Did you know: You can save time and drive profitability using our Microcranes®. Designed to fit through a doorway and inside elevators, our equipment is cost efficient and transports easily around any jobsite, able to work in hard to reach and confined spaces. 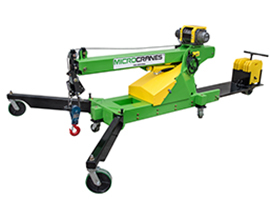 Microcranes, Inc. produces quality, portable mini cranes and material lifting equipment that streamlines productivity with a return on investment and cost efficiency in mind. Work on rooftops or floor to floor. 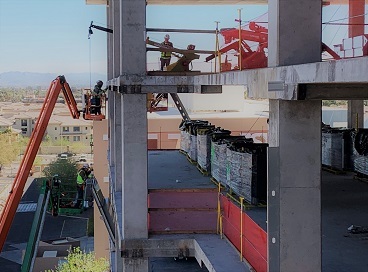 We offer two mobile hoist/mini crane models each using a patented counter weight system, outrigger system and compact footprint allowing the cranes to fit through doorways/inside elevators, tight spaces and be transported via elevator, truck or van. 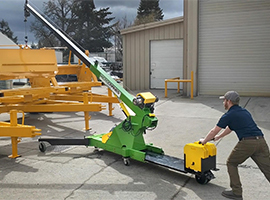 The patented base structure folds out easily to function as a stationary floor or roof crane, but is designed to safely pick and carry loads. Eco-friendly: zero emissions/low sound levels. 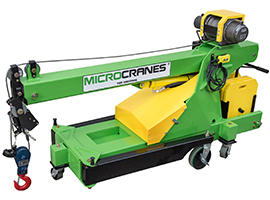 Microcranes® portable cranes are made to lift, drop, drag, pull, tug, transport, carry, stack, move, hold and set loads and heavy materials in any situation in interior or exterior of buildings, or on top of roofs. 24v battery power or electric models. 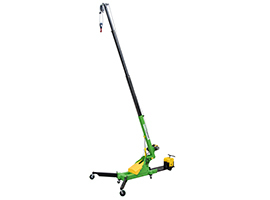 Small enough to fit inside a three foot residential doorway opening, elevator, narrow aisle, hallway or back of a truck, this vertical lifting mini crane allows rigging in tight spaces, restricted access and hard to reach areas or over and around obstacles. The M1 Global Model has dual batteries with a weatherproof on-board charger and a hydraulic boom, allowing full mobility and easy transport when folded in and compact. The T1 Global electric model requires electric 115v/230v for the winch (or manual hand crank spur option), and uses a hand pump hydraulic jack to raise and lower the boom into position for material handling. 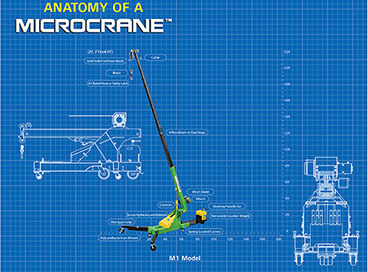 Industries that use small floor cranes and portable hydraulic floor cranes include aircraft/helicopters/aerospace, HVAC, pipe, steel, ports, military, oil refineries, warehouses, marinas, manufacturers/fabricators, water plants, energy/utilities, construction, auto, glass, glazing, shipping yards, film/tv/theatre rigging & production, concrete removal, plumbing, factories, stone, airlines, disaster deployment operations, aluminum installation, spa installment, farms, sewage, window installation, mining, AAC concrete block installation, cement, petrol exploration, railroad, marine, cruise lines and boats. Unlike material lifters from beneath, the spider-like mini crane lifts from above via cable and winch. Prevent injuries and workers comp. Diverse jobs require portable hoist devices and pushable floor cranes. Used for roof top lifting (ground to roof), floor to floor, interior or exterior industrial or residential building/construction applications. The T1 Global mobile Floor Crane using a manual winch is ideal for hazardous work environments (gas, vapors, comubustable dust) like the oil & gas industries. Our M1 Global 24v battery powered hydraulic boom crane allows mobility on jobsites. Compact, narrow, versatile and easy to use mini cranes serve vital infrastructure needs in utility markets and industrial construction like high-rise and skyrise buildings. Preform routine pick and carry or continuous rigging applications. Reduce costs by eliminating large crane rentals. 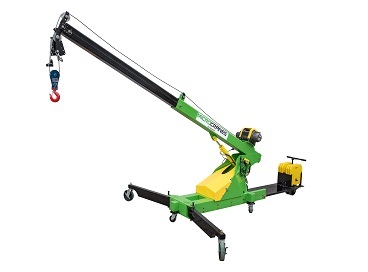 All of our small cranes utilize a box style boom with a hydraulic or manual jack. Pick and carry floor cranes are ideal for multi-purpose applications. Lifting capacities: 1 ton, half ton, 1/2 ton, 300 lb, 400 lb, 500 lb, 600 lb, 700 lb, 800 lb, 900 lb, 1000 lb, 1100 lb, 1200 lb, 1300 lb, 1400 lb, 1500 lb, 1600 lb, 1700 lb, 1800 lb, 2000 lbs. Lift height/boom extension to reach heights of: 6ft, 8ft, 10ft, 12ft, 15ft, 16ft, 18ft, 21ft. By placing the crane hoist on the roof, you can lower/drop material loads down sides of buildings at depths to 10 stories using an overhaul ball. Use for search and rescue missions, debri removal, installation, repairs and maintenance. Patented base allows a compact footprint, portability and pick and carry function with loads. Iron work. 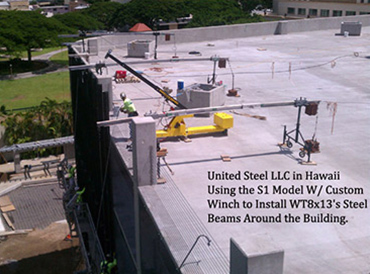 Steel beam construction. High rise construction. Roof top lifting hoist. Below the hook lifting. Heating and air conditioning (HVAC lift) unit repair and maintenance. Plumbing, pipes, duct work. Refrigeration. Heating/cooling. Maintenance. Applications include moving, installing materials. Pumps and motors, walls, pipes, compressors, timber frame erection, modular homebuilding, log cabins, custom/luxery, electrical and mechanical components, sheet metal, stairs, formed concrete structures, building materials, AAC blocks, telecom, mechanical equipment, slip concrete forms (slipforms), aluminum installation, railroads, landscaping, stone setting, pool building, residential glazing. 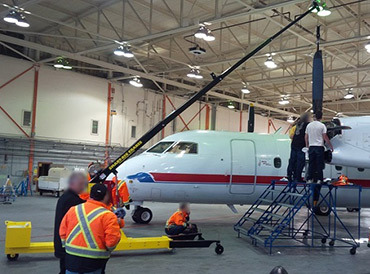 Installation and repairs in aviation facilities, airlines, manufacturing. MRO (maintenance repair & operations) equipment/supplies/tools. Control surfaces, wings, flaps, tail, helicopter engines, rotor gear heads, rotor blades, miscellaneous components. Use in Aviation facilities for the assembly and maintenance of planes and helicopters. Mobile crane for repairing or to remove parts such as inlet cowls, reversed cowl flap, slats in their aircraft fleets. Helicopter maintenance for ejection seat, rotary blades, ground support equipment (GSE), canopy windshield, vertical stabilizer, ammunition drum, horizontal stabilizer, cannon gun, window cockpit replacement. Warehouse, interior or exterior construction sites, roadways, road work, railroads, waterway refurbishments, wastewater, museums (setting statues), airlines, helicopter hanger, factories, transport and storage operations, shops, pumping stations, tunnels, loading docks, recycling, freight terminals, water treatment plants, ground support, water towers, farms, mining, drilling, oil refineries, lifting solution for removing and replacing differentials, automotive, hospitals, museums, grevyards, sports grounds, cinemas, stadiums, parks, subways, electric lines, water parks, swimming pools, transmissions, alternators, fuel tanks and engine components from truck and transit coaches, city or county machinery and vehicles, school and university maintenance. 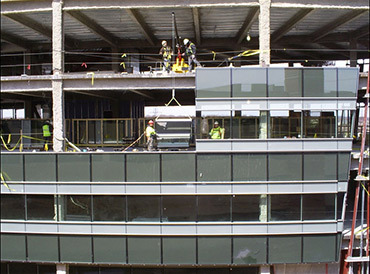 Curtain wall installation and repair. Window panel and glass pane manufacturing. Install signs, skylights. Use vacuum lifter suction cups to position and move heavy glass windows on commercial or industrial jobsites. Pick and carry, tilt, rotate, jib. Robotic lifter machine. Fabrication and shop crane. Auto, vehicle, machine, aircraft, military. Paper roller replacement. Gun manufacturing. Factory floor cranes. Material handling. Food packaging. Clean room environment hoists. Oil and gas, chemical industries, energy, sewer, water, recycle, municipals, hazardous environments. Army/Navy base maintenance. Vehicle maintenance and repair. Air force and aviation lifting tool. Helicopter repair and maintenance. Navy. FAA. GSE ground support equipment crane. Marina, cruise ships, docks, marinas, ferry boats, ports, cargo ships, ship building, scientific research, oceanography.